I've been so delighted with these new Cube Timers that I found recently. I have had several people request that I put these online and I love how this spices up our practicing! My daughters' teacher just concluded a contest that really helped reinforce smart practicing! 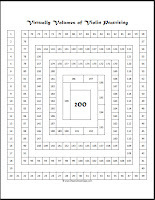 I often roll a die or spin a wheel or just tell my students or children to do an over and over spot _____ amount of times. I often do 10 times per day because I use a bead counter a lot. If it's a short over and over it may be 20 or 30 times a day. This contest counted the TIME rather than the repetitions and the great thing about using time instead of a quantity of times is that the quality of overs and overs is better. Each student has a cube timer and would practice hard spots in their piece over and over for that amount of time. 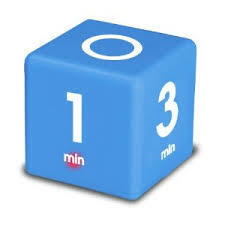 My younger daughter only has the attention span to do 1 minute at a time - so we flip the cube to the 1 and it would automatically start a 1 minute timer. She'd practice her spot for 1 minute and when the timer would go off she'd finish her spot and be done. (If she needed more time we'd do another minute.) 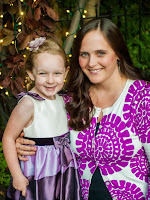 My older daughter would do her spots for longer - 3, 5, or 7 minutes. 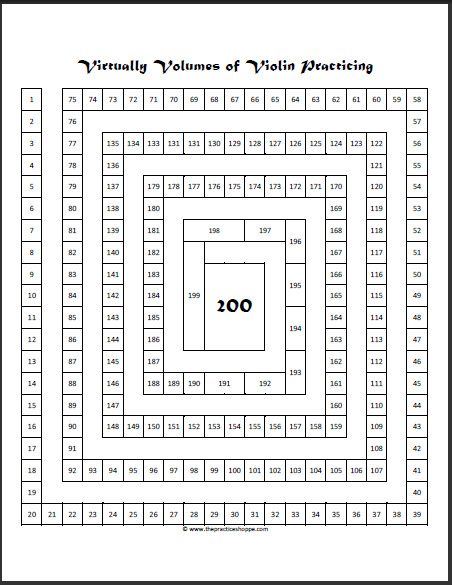 For every minute they did an over and over spot they would color in that many numbers on this chart. (5 minutes of overs and overs would be 5 numbers.) At the end of the summer every student handed in their charts and everyone got a prize, but the people with most minutes got to choose first. Since the contest finished we have still been practicing using the cube timer almost daily...it's become part of our routine. My 4 year old does at least one task for 1 minute using the cube timer each day (this week it's circle bows.) My 7 year old uses part of her practicing just going over difficult spots in her pieces using the cube timer. With her I sometimes roll a die to determine how many spots we need to do - and then we do that many spots with the timer. The biggest success has been with my 11 year old who practices on her own. She's using the timer to practice all sorts of spots in her pieces. Her practicing has gone from playing her pieces over and over to playing spots in her pieces over and over. 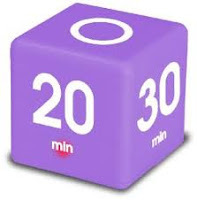 What I like most about these cube timers is that they are so easy to use. I know most timers aren't very hard to use, but it requires pushing buttons and setting, or resetting the timer. With the cube timer all you have to do is just flip the cube and the timer starts. There is a digital timer on the bottom if you are curious how far along you are on the timer. There is light on the top so you know it's working. You can purchase these Cube Timers at The Practice Shoppe!